Kariyat is an erect annual herb extremely bitter in taste in all parts of the plant. It grows erect to a height of 1-4 ft in moist shady places with smooth leaves and white flowers with rose-purple spots on the petals. Stem dark green, 0.3 – 1.0 m in height, 2-6 mm in diameter, quadrangular with longitudinal furrows and wings on the angles of the younger parts, slightly enlarged at the nodes; leaves glabrous, up to 8.0 cm long and 2.5 cm broad, lanceolate, pinnate; flowers small, in lax spreading axillary and terminal racemes or panicles; capsules linear-oblong, acute at both ends, 1.9 cm x 0.3 cm; seeds numerous, sub quadrate, yellowish brown. Medicinal uses: Since ancient times, Kariyat is used as a wonder drug in traditional Siddha and Ayurvedic systems of medicine as well as in tribal medicine in India and some other countries for multiple clinical applications. The therapeutic value of Kalmegh is due to its mechanism of action which is perhaps by enzyme induction. The plant extract exhibits antityphoid and antifungal activities. 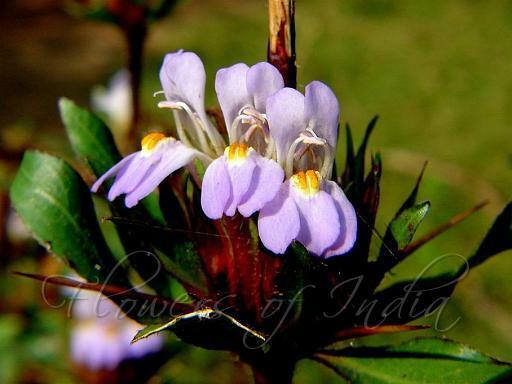 Hophead is a popular medicinal plant distributed in mountains of southern and western India. Shrubbery plant with single dark green leaves, red-brown branches, and flowers that bloom in upright spikes. It is an erect shrub with smooth, hairless stems and leaves. Leaves narrowly obovate, spine-tipped, 3.5-9 cm long, 0.8-1.2 cm wide. Flowers occur in a terminal spike with overlapping bracts which are broadly ovate, 15 mm long, green with purple upper half. 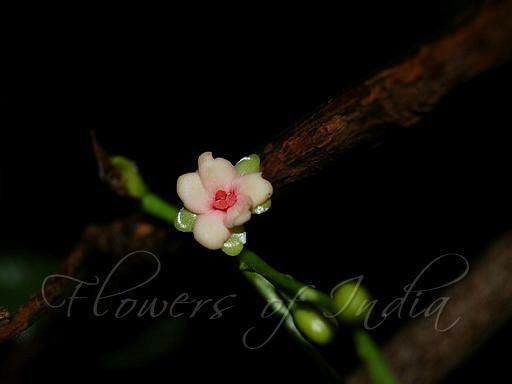 Flower consists of a 3m long corolla tube, opening into 1 cm long petals. Longer stamen filaments 2 cm long; shorter stamens fertile. Style is 3 cm long and smooth. Porcupine flower is an erect, prickly shrub, usually single-stemmed, growing to about 1.5 m tall. The stems and branches are stiff and smooth and light brown to light grey in colour. The leaves are up to 100 mm long and 40 mm wide, and oval-shaped though narrow at both ends (ellipsoid) The base of the leaves is protected by three to five sharp, pale coloured spines, 10-20 mm long. The yellow-orange tubular flowers are found bunched tightly together at the top of the plant, but they also occur singly at the base of leaves. The flowers are 40 mm long and tubular, with several long protruding stamens. The seed capsule is oval-shaped and 13-20 mm long, with a sharp pointed beak. It contains two fairly large, flat seeds, typically 8 mm long by 5 mm wide, covered with matted hairs. Barleria has a central tap root, with lateral roots branching off in all directions. Medicinal uses: It has numerous medicinal properties including treating fever, respiratory diseases, toothache, joint pains and a variety of other ailments; and it has several cosmetic uses. A mouthwash made from root tissue is used to relieve toothache and treat bleeding gums. 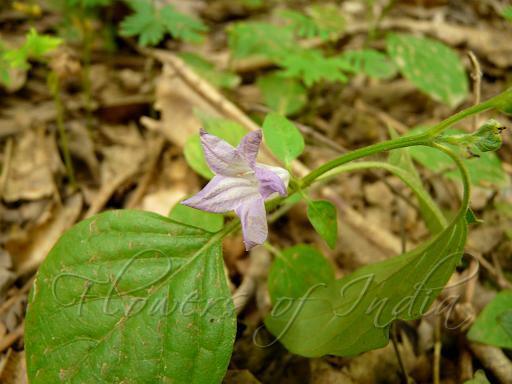 The whole plant, leaves, and roots are used for a variety of purposes in traditional Indian medicine. For example, the leaves are used to promote healing of wounds and to relieve joint pains and toothache. Because of its antiseptic properties, extracts of the plant are incorporated into herbal cosmetics and hair products to promote skin and scalp health. 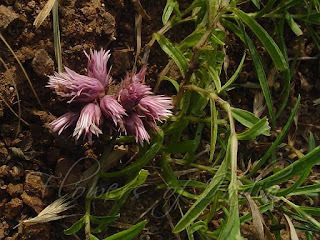 Bell Weed is a prostrate perennial herb, with stems often rooting at the nodes. Ovate green leaves, 2-10 cm long, have lower surface conspicuously paler. Leaf stalk is 5-30 mm long. Flowers occur solitary in the leaf axils, each one subtended by oblanceolate to ovate bracts 1.5-2.3 cm long. Sepals 5, linear, 6-10 mm long. 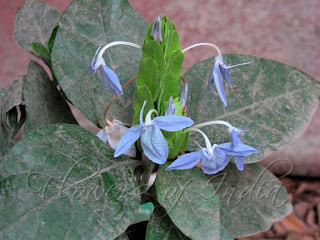 Flowers are violet blue to occasionally nearly white, 2.4-3.2 cm long, the petals slightly spreading. Capsules club-shaped, 1.5-2 cm long, densely covered with fine hairs. Flowering: August-September. Medicinal uses: Believed to be anticancer against the epidermis of the nasopharynx region and slightly hypoglycemic. Blue Fox Tail is a shrubby plant, with 4-sided flower-spikes at the end of branches. Bracts are oval, entire, mucronate. Leaves are elliptic-oblong, narrowed at both ends, velvety. Flowers are large, greenish blue. Upper lip of the flower is linear, reflexed. Blue Fox Tail is found in Mumbai and Konkan region. Medicinal uses: Plant is used in gout and dysuria; decoction of leaves for stricture. Roots are given in jaundice, menorrhagia and rheumatism. Marsh Barbel is a stout aquatic perennial herb, 1-2 m high. Erect unbranched stems are hairy near swollen nodes. Densely hairy, lance-like, stalkless leaves, 10-15 cm long, occur in whorls of 6 at each node on the stem. Straight, yellow, 4 cm long spines are present in the axil of each leaf. Flowers occur in 4 pairs at each node. 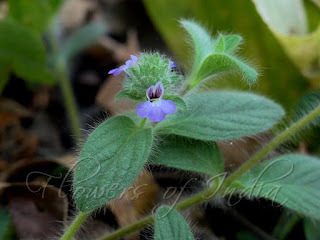 The 3 cm long purple-blue flowers are 2-lipped – the upper lip is 2-lobed and the lower one 3-lobed with lengthwise folds. Flowers open in opposite pairs. Flowering: October-April. Medicinal uses: Kokilaksha, as it is known in sanskrit, was extensively used in Ayurvedic system of medicine for various ailments like rheumatism, inflammation, jaundice, hepatic obstruction, pain, etc. 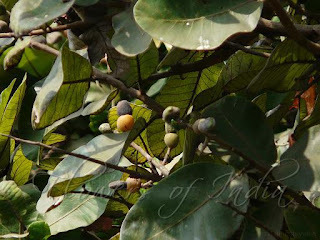 Malabar nut is a small evergreen, sub-herbacious bush which grows commonly in open plains, especially in the lower Himalayas. 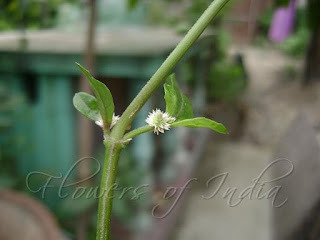 The Leaves are 10 to 16 cms in length, minutely hairy and broadly lanceolate. A herbal plant which requires very little watering and is an extremely hardy plant is Malabar nut. If there is one herbal plant that needs to be singled out for propagation and planting on a large scale, it would be this one. Adhatoda in Tamil, meaning a plant shunned by herbivorous animals. 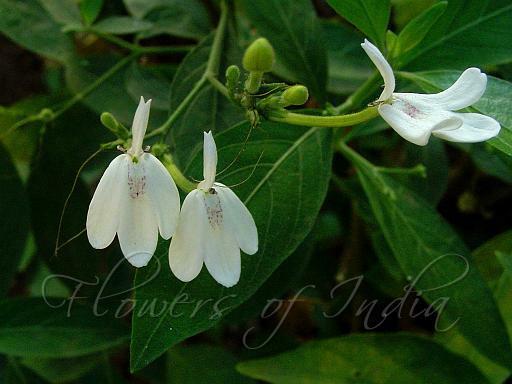 Propagated easily by cuttings, grows to a height of eight to 14 feet and has attractive white flowers. Medicinal uses: Adhatoda is useful for curing coughs, colds and asthma and is easy to administer.It has been used for centuries, and is mentioned in Sanskrit scriptures. Gandarusa is an erect, branched, smooth undershrub 0.8-1.5 m tall. The leaves are lance-shaped, 7-14 cm long, 1-2.5 cm wide, and pointed at the ends. 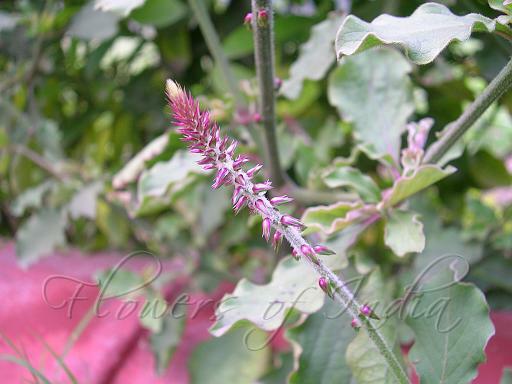 The rather small flowers are borne in 4-12 cm long spikes, at the end of branches or in leaf axils. The teeth of the sepals cup are smooth, linear, and about 3 mm long. The flowers are about 1.5 cm long, white or pink, with purple spots. The capsule is club-shaped, about 12 mm long, and smooth. 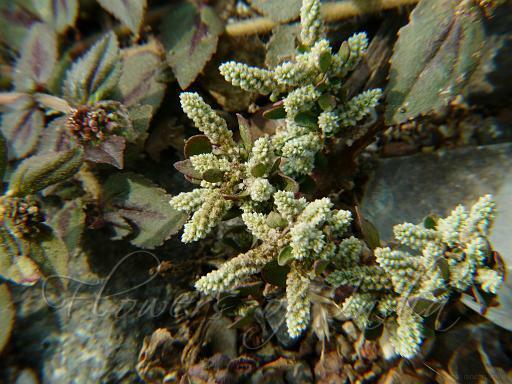 Water Willow is a slender, often tufted, prostrate or ascending, branched perennial herb. The stems are 10-40 cm long. The leaves are elliptic to oblong-ovate or ovate, 7-20 mm long, 5-20 mm wide, obtuse at both ends, and entire or slightly crenate as to margin. The flowers are pink, 6-7 mm long, and borne in terminal, rather dense, cylindric spikes 1-5 cm long and about 5 mm in diameter. The bracts and sepals are green, linear-lanceolate, and hairy. The fruit (capsule) is slightly hairy and about 4 mm long. Medicinal uses: The herb contains a bitter alkaloid and that it is used as a substitute for Fumaria. It is alternative and expectorant and is given in the form of infusion (1 to 20) in asthma, coughs, and rheumatism. The juice of the leaves is squeezed into the eyes in cases of ophthalmia. The odor of the whole plant is unpleasant; it is used in decoction for backache, plethora, and flatulence. Crested Lepidagathis is a perennial herb, with almost no stem. Branches, 20 cm long, arise out of a globose head on the ground, and spread out. Flowers are also arise stalkless from this globose head. Flowers are pale pink, 2-lipped. The upper lip is notched, and the lower lip is divided into 3 lobes. Frilly Lepidagathis is a prostrae to suberect undershrub, up to a foot tall. Twigs are quardrangular, bristly or glabrous twigs, arising from a woody rootstock. Leaves are sessile, linear to narrowly lanceshaped, 2-4.5 cm long, 3-5 mm broad, hairless, 3-nerved from the base, lateral nerves weaker than midrib and run along entire margin. Flowers are light pink, in dense, one-sided stalkless oblong-ovoid spikes, 1-2 cm long, in leaf axils. The spikes are fascicled near rootstock or a little higher up. Flowers have a frilly appearance because of the long, spine-tipped bracts. Bracts are ovate or elliptic-ovate, 4-5 x 2.5-3 mm, with a 3.5-4.5 mm long recurved spine at the tip. Bracteoles are nearly as long as long bracts, outer oblong-lanceshaped, long-pointed, inner wedge-shaped, membranous. Sepals are 5, 7-8 mm long, membranous, pointed but not spine-tipped. Flowers are spotted inside, 5-6 mm long, densely long silky hairy in bud, upper lip slightly notched, lower lip with 3, patent obtuse lobes. Capsule is ovoid-lanceshaped, 5-6 mm long, 2-seeded, hairless. Flowering: September-February. Medicinal uses: The plant is used as a bitter tonic. It is used for rheumatic affections. Blue Pussyleaf is a softly velvety trailing or erect herb of shaded locations, often stream-beds of the savanna grasslands in Africa. 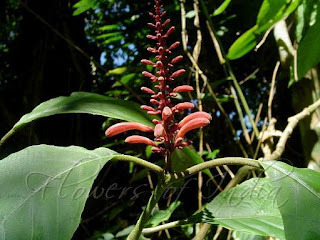 It is naturalized in India and many other parts of the tropical world. Stems are up to 35 cm long, most parts densely covered in soft spreading hairs. Oppositely arranged leaves are elliptic, with margin entire. Flowers are borne in cylindrical spikes at the end of branches, with ovate, glandular and hairy bracts. Flowers are 2-lipped, mauve-blue, purplish or white, with 5 petals. Capsule are oblong, slightly beaked. This perennial plant is native to India, and is abundantly found growing in places like Nainital. It is a herb growing up to 50 cm tall. The leaves are lanceolate to ovoid-acute, 2–7.5 cm long and 1–3.5 cm wide. 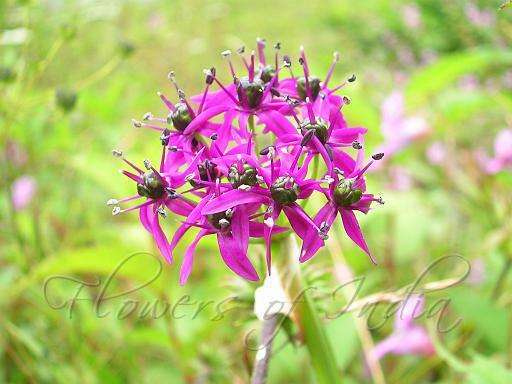 The flowers are two-lobed, the long axis up to 5 cm long; they are magenta to reddish-violet. Medicinal uses: The plant is used in traditional Chinese medicine. Wild Nongmangkha is a large branched shrub, up to 3-4 m tall. Oppositely arranged leaves are 8-10 inches long. They are elliptic, pointed at both ends, sometimes somewhat toothed. Flowers are borne in upright spikes at the end of branches. Flowers are long, tube-like, reddish. The end of the tube is 2-lipped. Stamens are 2, slightly protruding out. Wild Nongmangkha is found in NE India. Medicinal uses: In Manipur, boiled leaf juice is used as a tea-like drink to cure cough and fever. Flowers are eaten raw or fried as tonic. In Arunachal Pradesh, pounded flowers are used as condiment. 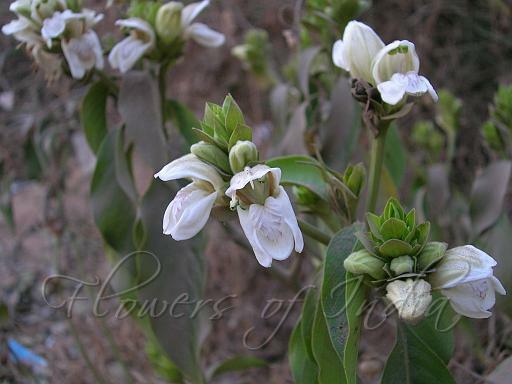 Nongmangkha is a gregarious shrub, common in the Manipur valley. This plant has long orange-red tubular flowers, appearing in upright spikes at the end of branches. Leaves are ovoid to lance-like, with smooth margins. In Manipur, it is an extremely popular medicinal plant. 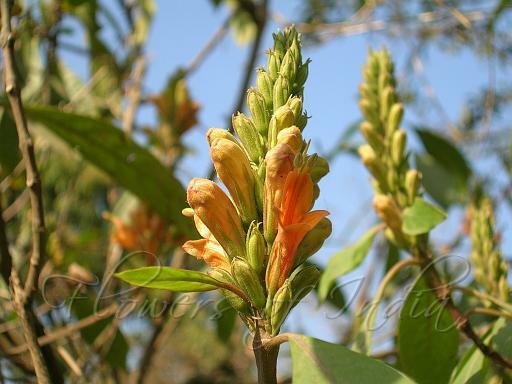 Medicinal uses: In Manipur, local people prefer it to Malabar Nut (Justicia adhatoda) It is useful for curing coughs, colds and asthma and is easy to administer. Flowers are antidote to pox, prevents skin diseases like sore, scabies etc. 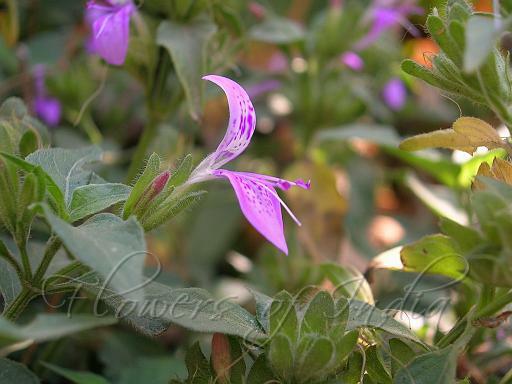 Native to India, this useful plant is a slender, erect, branched, somewhat hairy shrub 1-2 m in height. 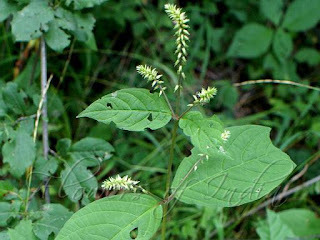 The leaves are oblong, 4-10 cm in length, and narrowed and pointed at both ends. The inflorescence is a spreading, leafy, hairy panicle with the flowers usually in clusters. The calyx is green, hairy, and about 5 mm long. The corolla-tube is greenish, slender, cylindric, and about 2 cm long. The flowers is 2-lipped; the upper lip is white, erect, oblong or lancelike, 2-toothed at the apex, and about 3 mm in both length and width; and the lower lip is broadly obovate, 1.1-1.3 cm in both measurements, 3-lobed, and white, with a few, minute, brownish dots near the base. The fruit (capsule) is club-shaped and contains 4 seeds. Medicinal uses: In India the fresh root and leaves, bruised and mixed with lime juice, are a useful remedy for ringworm and other skin affections. The seeds also are efficacious in ringworm. The root-bark is a remedy for dhobie’s itch. In Sind it is said to possess extraordinary aphrodisiacal powers, the roots boiled in milk being much employed by Hindu practitioners. The roots are believed n some parts of India to be an antidote to the bites of poisonous snakes. Karvy is a purplish-blue wild flower, which blooms once every seven years. The plant was first discovered by Nees, a resident Britisher of Mumbai in the last century. The Karvy plant grows wild around Mumbai, Madhya Pradesh, Parts of Gujarat and in large areas of Konkan and North Kannara Ghats. It is a shrub growing 2-6 m tall. Oppositely arranged, elliptic-lancelike toothed leaves are 10-20 cm long. Each year the plant comes alive with the advent of Monsoon,and once the rains are over, what is left behind is dry and dead-looking stems.This pattern repeats itself for seven years. In the seventh year, the plant explodes into mass flowering. The Karvy plant has many uses as well. The leaves and the stems are also used for thatched roofs after the season is over. Medicinal uses: The Karvy leaves are crushed and the juice is believed to be a sure cure for stomach ailments. 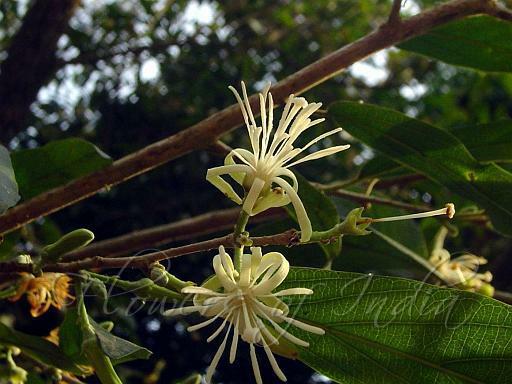 Singkrang is an evergreen tree, commonly found in NE India – Manipur, Mizorm, Assam etc. The tree is distinguished by its large elliptic leaves which are conspicuously rusty-haired beneath. Flowers arise in lax clusters of pink flowers. Flowers are very numberous, and the buds looks like pink balls. Sepals are whitish, unlike a similar, better known species Saurauia napaulensis, where the sepals are dark pink. Petals are 5, pink, strongly overlapping, giving a cup shape to the open flower. Flowers generally hang looking down. Flowering: May-August. Medicinal uses: A gummy or gelatinous substance produced by the leaves is used for preparing hair pomade. Sage Leaved Alangium is a tall thorny tree native to India. It grows to a height of about 3 to 10 meters.The bark is ash colored, rough and faintly fissured. The leaves are elliptic oblong, elliptic lanceolate or oblong lanceolate. The flowers are greenish white, fascilcled, axillary or on old wood. The berries are ovoid, ellipsoid or nearly globose.glabrous, smooth and violet to purple. The flowering season is February to June. 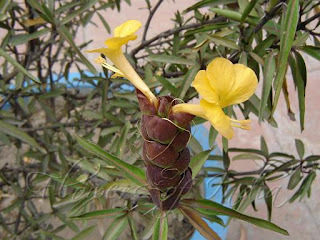 Medicinal uses: In Ayurveda the roots and the fruits are used for treatment of rheumatism, and hemorrhoid.Externally it is used for the treatment of bites of rabbits, rats, and dogs. Chives are a species of flowering plant in the onion family Alliaceae, native to Europe and Asia. They are referred to only in the plural, because they grow in clumps rather than alone. Chives are hardy, draught tolerant, perennials, eight to twenty inches tall, that grow in clumps from underground bulbs. The leaves are round and hollow, similar to onions, but smaller in diameter. 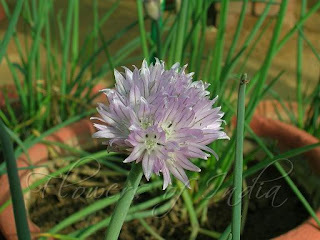 In June or July, chives produce large round flower heads consisting of purple to pink flowers. The flowers, which bloom for two months in midsummer, form round deep purple or pink globes that make an attractive garnish. Chives are grown for their leaves, which are used as a vegetable or a herb; they have a somewhat milder flavour than onions, green onion or garlics. Among the latter three Allium plants, chives resemble most the ordor of green onions. Medicinal uses: The ancient Chinese are the first documented to be using chives, as long ago as 3000 years B.C. The Romans believed chives could relieve the pain from sunburn or a sore throat. They believed that eating chives would increase blood pressure and acted as a diuretic. Alpine Leek is interesting onion-like plant, with cylindrical bulb 4-6 cm long, coat net-veined, fibrous. Leaves are 3-6, stalked, broadly lanceshaped to elliptic, 10-20 cm long, 4-6 cm broad, shorter than the flowering stem. Flowers are borne in an umbel, atop a long leafless stem. Flower-stalks are 1-2 cm long. Tepals are white to yellow-white, 5 mm long, oblong, pointed to blunt. Filaments are longer than the tepals, entire, outer narrower, subulate, inner broader, lanceshaped. Style is protruding. Seeds are almost spherical. Bulb is eaten raw or cooked, as sn onion substitute. The plants are as pungent as garlic. The bulbs are rather small, about 1-2 cm in diameter, and are produced in clusters on a short rhizome. Leaves are eaten raw or cooked. The stems and leaves are eaten, they are much favoured in Japan. Flowers are eaten raw or cooked. The juice of the plant is used as a moth repellent. The whole plant is said to repel insects and moles. Alpine Leek is found in the Himalayas, C. Asia and E. Asia, at altitudes of 600-2500 m. Flowering: June-August. Medicinal uses: The root is antiscorbutic, carminative, diuretic and vermifuge. Used in the treatment of profuse menstruation. Himalaya Onion is a deciduous bulb that grows to 1.0 meters high by 0.5 meters wide. 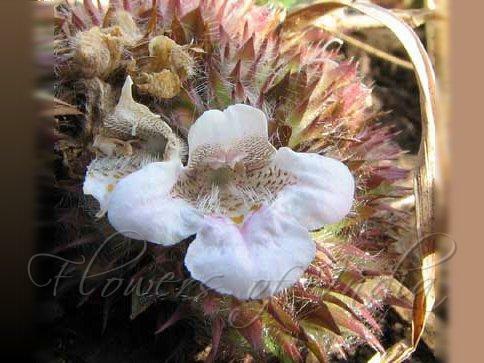 It grows in Himalyan foothills between 2300-6600 m. It sports hemispheric umbels of purple flowers. In Nepal, Himalaya onion is often used for cooking, especially for flavouring dal (दाल) boiled legumes. Rather uniquely, jimbu leaves are usually employed in the dried state and fried in butter fat to develop their flavour. Medicinal uses: The bulbs, boiled then fried in ghee, are eaten in the treatment of cholera and dysentery. The raw bulb is chewed to treat coughs and colds. It is said that eating the bulbs can ease the symptoms of altitude sickness. Members of this genus are in general very healthy additions to the diet. They contain sulphur compounds (which give them their onion flavour) and when added to the diet on a regular basis they help reduce blood cholesterol levels, act as a tonic to the digestive system and also tonify the circulatory system. Prickly Chaff-flower is an erect or prostrate, annual or perennial herb, often with a woody base, which grows as wasteland herb every where. Since time immemorial, it is in use as folk medicine. It holds a reputed position as medicinal herb in different systems of medicine in India. Stems 0.4-2 m, pilose or puberulent. Leaf blades elliptic, ovate, or broadly ovate to orbiculate, obovate-orbiculate, or broadly rhombate, 1-20 × 2-6 cm, adpressed-pubescent abaxially and adaxially. Inflorescences to 30 cm; bracts membranous; bracteoles long-aristate, spinose; wings attached at sides and base. Flowers: tepals 4 or 5, length 3-7 mm; pseudostaminodes with margins fimbriate at apex, often with dorsal scale. According to the Black Yajurveda, Indra, having killed Vritra and other demons was overcome by Namuchi and made peace with him, promising never to kill him with any solid or liquid, neither by day or by night. But Indra collected some foam, which is neither solid nor liquid, and killed Namuchi in the morning between night and daybreak. From the head of the demon sprung the herb Apamarga, with the assistance of which Indra was able to kill all demons. Hence this plant has the reputation of being a powerful talisman, and is now popularly supposed to act as a safeguard against scorpions and snakes by paralysing them. Medicinal uses: Different parts of the plant are ingredients in many native prescriptions in combination with more active remedies. In Western India the juice is applied to relieve toothache. The ashes with honey are given to relieve cough; the root in dosed of one tola is given at bedtime for night blindness, and rubbed into a paste with water it is used as an anjan (eye salve) in opacities of the cornea. The seeds are often used as a famine food in India, especially in Rajputana, where the plant is called Bharotha (grass). Ox Knee is an erect or straggling herb, 0.6-2 m, much-branched. Stem and branches are indistinctly quadrangular or channeled, hairless to moderately (rarely more densely) hairy, the nodes frequently much shrunken when dry. Leaves are elliptic-oblong to broadly oval, rarely narrowly lanceshaped, shortly or longly long-pointed, gradually or more abruptly narrowed below, 9-22 x 2.5-8.5 cm, usually thinly hairy, rarely densely appressed-hairy on the lower surface. Stalks of main stem leaves are 0.3-2 cm long, shortening above and below. Inflorescences at first dense, finally lax and elongating to as much as 20 cm but commonly about half this length, the inflorescence stalk is 1-4 cm. Bracts are narrowly lanceshaped, brownish-membranous, 3-5 mm, hairless. Bracteoles are 3.5-5.5 mm. Tepals are 5, 4-7 mm, the outer longest, all narrowly lanceshaped, very acute, with a distinct midrib and 2 obscure or obvious lateral nerves, narrowly pale-margined. Capsule is 2-3 mm. Seed filling the capsule, cylindrical smooth. This species is globally distributed in the Paleotropics. Within India, it is found throughout the hilly regions between an altitude range of 1200-3200 m, and is common in waste places and in shady oak-forests. Medicinal uses: In Nepal its root juice is used for toothache. Its seeds have been used as a substitute for cereal grains in famine years. The plant is used externally in the treatment of leech bites in Mizoram, India and a decoction as a diuretic. Mountain Knot Grass is a perennial herb, occasionally woody below, prostrate to erect, 0.3-2 m, branched from the base and often also from above. Stem and branches are densely woolly with whitish or yellowish, shaggy hairs. Alternately arrange leaves are nearly circular to lanceshaped-elliptic, wedge-shaped at the base, rounded to sharp at the tip. Leaves are usually densely woolly on the lower surface and more thinly so above. Leaves on the main stem are 1-5 cm long, 0.5-3.5 cm wide, those of the branches and upper part of the stem are smaller. Leaf stalks are up to 2 cm. Flower spikes are stalkless, solitary or usually in clusters in leaf axils, 0.4-1.5 cm long, 3-4 mm wide, divergent, cylindrical, silky white to creamy, forming a long inflorescence leafy to the ultimate spikes. Medicinal uses: This herb is described as one of the best known remedies for bladder and kidney stones. Ayurvedic practitioners recommend a decoction of the plant to be taken internally for a few days to dissolves the stone and to clear the urinary path. Sessile Joyweed is a perennial herb, often found in and near ponds, canals and reservoirs. It prefers places with constant or periodically high humidity and so may be found in swamps, shallow ditches, and fallow rice fields. A much branched prostrate herb, branches often purplish, frequently rooting at the lower nodes; leaves simple, opposite, somewhat fleshy, lanceolate, oblanceolate or linear-oblong, obtuse or subacute, sometimes obscurely denticulate, glabrous, shortly petiolate; flowers small, white, in axillary clusters; fruits compressed obcordate utricles, seeds suborbicular. Medicinal uses: Stems and leaves useful in eye trouble. Decoction is taken with little salt drunk to check vomiting of blood. Shoot with other ingredients used to restore virility. Poultice used for boils. 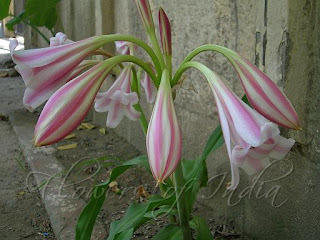 This old fashioned crinum lily is a low maintence plant that produces lovely, large, striped, lily-like flowers. The stripes are alternately wine pink and white. The flowers also have a wonderful faintly sweet fragrance. The tall bloom stalk stands about 18-24 inches above the abundant foilage and hold 5+ blooms at a time! These will produce several flower stalks during the warmer months with the majority of blooms coming in the spring and fall. These lilies will multiply by producing bulbs underground as well as from the seeds that form after the blooms. You’ll have a lovely large group of these in no time. Milk and Wine Lily is native to India. Flowering: June-August. Medicinal uses: Bulbs are extremely acrid. When roasted, they are used as a rubefacient in rheumatism. Crushed and toasted bulb is applied to piles and abscesses to cause suppuration. The juice of the leaf is used in earache. Marking Nut is a moderate-sized deciduous tree with large stiff leaves. Leaves are 7-24 inches long, 2-12 inches wide, obovate-oblong, rounded a t the tip. Leaf base is rounded, heart-shaped or narrowed into the stalk, leathery in texture. Flowers is small, borne in panicles shorter than the leaves. Fruit is a drupe 1 inch long, ovoid or oblong, smooth and shining, black when ripe, seated on a fleshy cup. The stem yields, by tapping, an acrid, viscid juice from which a varnish is prepared. The nut yields a powerful and bitter substance used everywhere in India as a substitute for marking ink for clothes by washermen, hence it is frequently called Dhobi Nut. It gives a black colour to cotton fabrics, but before application it must be mixed with limewater as a fixator. The fruits are also used as a dye. 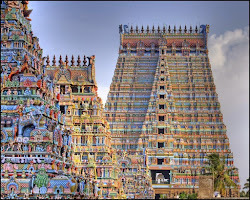 They are also largely employed in Indian medicine. The fleshy cups on which the nuts rest and the kernels of the nuts are eaten. Medicinal uses: The fruit is useful in leucoderma, scaly skin, allergic, dermatitis, poisonous bites, leprosy, cough, asthma, and dyspepsia. It is extremely beneficial in the diseases like piles, colitis, diarrhea, dyspepsia, ascites, tumours and worms. The topical application of its oil on swollen joints and traumatic wounds effectively controls the pain. 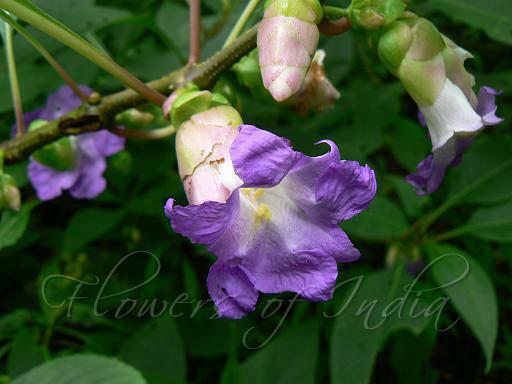 Kardal is a climbing shrub, a liana, found in the Western Ghats. It can grow up to 2-3 m long. Branches are hooked. Alternately arranged leaves are oblong, leathery, 10-25 cm long, deep green, shining, carried on short stalks. Flowers are white, with 5 petals, 5 sepals and 10 stamens. They fall off quite soon. Fruits are round, 3-6 cm, with unequally winged sepals. Medicinal uses: The use of its roots in treating AIDS is being actively explored. Flowering: January-February. A small tropical tree, indigenous to the Amazon rainforest, growing up to 20′ tall. The leaves are thin, oblong while the flowers are greenish – yellow. Flowers are oblong, 1 to 1 1/2 in long, never fully open, with 1 in long, drooping stalks, and 3 fleshy outer petals, yellow-green on the outside and pale-yellow inside with a purple or dark-red spot at the base. The avoid or conical fruit, with a purple knobby skin, is very sweet and is eaten fresh or can be used for shakes. The fruit is juicy and creamy – white; it may contain up to 40 black seeds. These seeds are poisonous. From delicious fruits of Sitaphal, jelly, jam, conserves, sharbets, syrup, tart and fermented drinks are prepared. The peelings and pulps contain oil that is useful in flavouring. 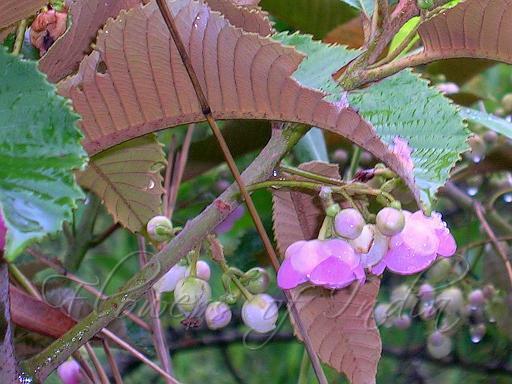 Medicinal uses: The bark and leaves contain annonaine, an alkaloid. In tropical America, a decoction of the leaves is used as a cold remedy and to clarify urine. A bark decoction is used to stop diarrhea, while the root is used in the treatment of dysentery. 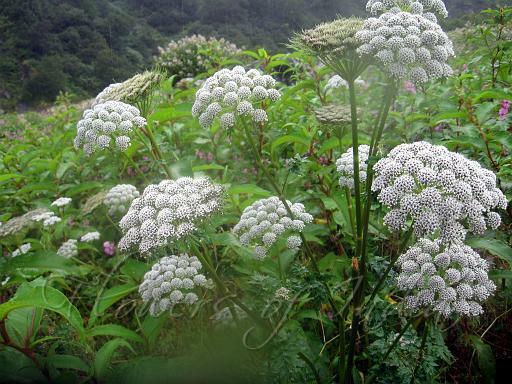 Smooth Angelica is a critically endangered plant of the Himalayas. Plants are 1-2.5 m tall, glabrous, aromatic. Root are thick, long-conic. Stem are stout, ribbed. Leaves are long-stalked, triangular, 20-30 × 20-25 cm, 2-3-ternate-pinnate, primary pinnae long-petiolulate, proximal pinnules 3-foliolose. Leaflets are stalkless, ovate to oblong-ovate, 3-5 × 1.5-2.5 cm, base wedge-shaped, margin toothed with pin-like points, glaucous on the underside. Flower clusters are carried on 15-25 cm long stalks. Vracts are 5, linear, 1.5-2.5 cm, reflexed. Rays are 15-20, 2-6 cm long, nearly equal. Bracteoles are 6-10, linear, about 6 mm, reflexed. Calyx teeth obsolete. Petals are white, obovate. Fruit is oblong-ellipsoid, 0.8-1.2 cm × 4-6 mm, with dorsal ribs prominent, thick, obtuse-rounded, lateral ribs broad-winged. Smooth Angelica is endemic to India found in Western Himalaya in Jammu & Kashmir, Himachal Pradesh (Simla) and Uttar Pradesh between an altitude range of 1800-3700 m. Flowering: June-August. 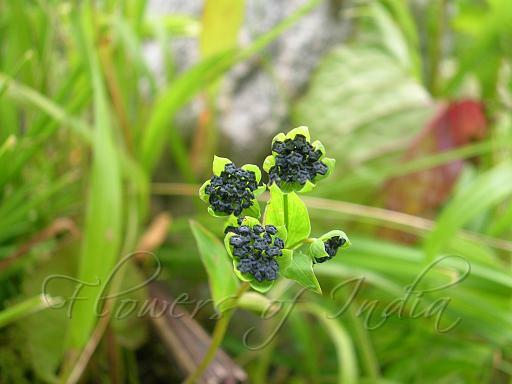 Himalayan Thorowax is a medicinal plant whose Chinese cousin is popular in Chinese medicine. 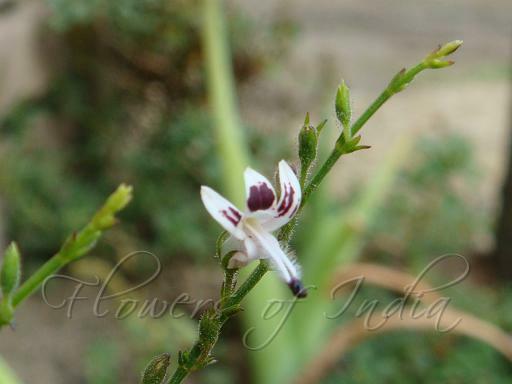 It is an erect perennial herb which grow upto 1 m high. Oblong-ovate stem leaves are almost without stalk, and have an smooth margin. Tiny flowers appear in compound umbels 2.5–4 cm across, typical of the carrot family. 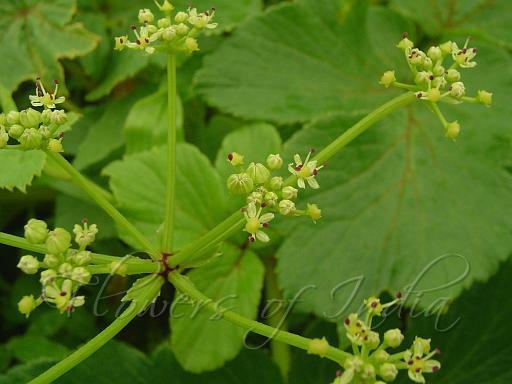 The flowers themselves are very small, and appear in a bunch of 10-15 in secondary umbels 8–12 mm across, enclosed in unequal bracts which looks like leaves. The flowers petals are either pale yellow or dark purple. Himalayan Thorowax are found in mixed forests on shady slopes, open forests, mountain slopes, grassy places, at altitudes 2400-4000 m. This genus is very confusing and species are highly variable. Medicinal uses: The roots of several species of Bupleurum are famous for their use as the traditional Chinese medicine “chai hu” for treatment of coughs, fevers, and influenza. Almost all of the species are recorded in the literature as regional substitutes for “chai hu” or for other local medicinal purposes. However, caution should be applied as a very few species are toxic (e.g., B. longiradiatum) and can result in “toxic strike” if misused as such substitutes. 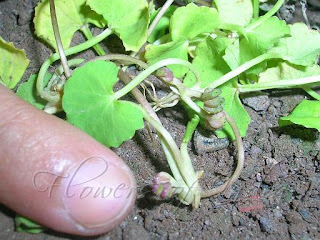 Indian Pennywort is a small creeping herb with shovel shaped leaves emerging alternately in clusters at the stem nodes. The runners lie along the ground and the inch long leaves with their scalloped edges rise above on long reddish petioles. The insignificant greenish- to pinkish-white flowers are borne in dense umbels (clusters in which all the flower stalks arise from the same point) on separate stems in the summer. The seeds are pumpkin-shaped nutlets 0.1-0.2 in long. In India it is revered as a medicinal herb, and particularly in Manipur the full plant is eaten as food like a leafy vegetable. Indian Pennywort appears to have originated in the wetlands of Asia. China, India, and Malaya were probably within its original range. Medicinal uses: Indian Pennywort is revered as one of the great multi-purpose miracle herbs of Oriental medicine. It has been in use for thousands of years and has been employed to treat practically every ailment known to man at one time or place or another. The leaf and root extract has been used in Ayurvedic medicine for a long time but has become very popular in the past couple of years for both internal use as well as topical application – although the cosmetic application is relatively new. In Ayurvedic practice it also has a valuable and sought-after Vayasthapana effect – helping to retard the aging process. Wild Carrot is a variable biennial plant, usually growing up to 1 m tall. 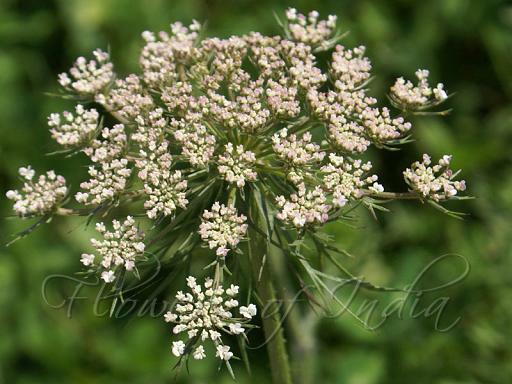 The umbels are claret-colored or pale pink before they open, then bright white and rounded when in full flower, measuring 3-7 cm wide with a festoon of bracts beneath. Finally, as they turn to seed, they contract and become concave like a bird’s nest. The dried umbels detach from the plant, becoming tumbleweeds. Similar in appearance to the deadly poison hemlock, Wild Carrot is distinguished by a mix of bi-pinnate and tri-pinnate leaves, fine hairs on its stems and leaves, a root that smells like carrots, and occasionally a single dark red flower in its center. Like the cultivated carrot, the wild carrot root is edible while young, but quickly becomes too woody to consume. 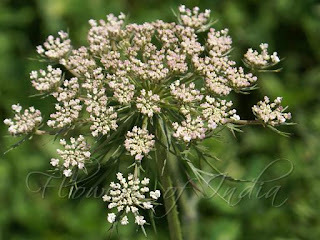 Wild carrot is native to Pakistan, Kashmir, West Asia and parts of Europe. Flowering: June-August. Medicinal uses: A teaspoon of crushed seeds has long been used as a form of birth control; its use for this purpose was first described by Hippocrates over 2,000 years ago. Research conducted on mice has offered a degree of confirmation for this use – wild carrot was found to disrupt the ovum implantation process, which reinforces its reputation as a contraceptive. Chinese studies have also indicated the seeds block progesterone synthesis, which could explain this effect. This beautiful flower from the carrot family adorns the Valley of Flowers with its typical carrot like white flowers appearing in dense umbels. Medicinal uses: The root is used in Tibetan medicine, where it is considered to have a bitter and acrid taste with a neutral potency. Analgesic, anthelmintic and anti-inflammatory, it is used in the treatment of contagious diseases, swelling/pain in the joints and arthritis. 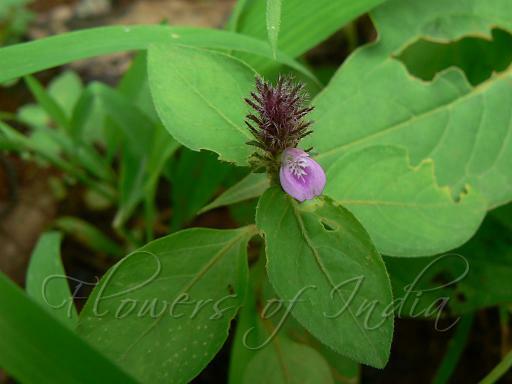 It is also used in the treatment of all types of pain, toothache and the inability to micturate or defecate. 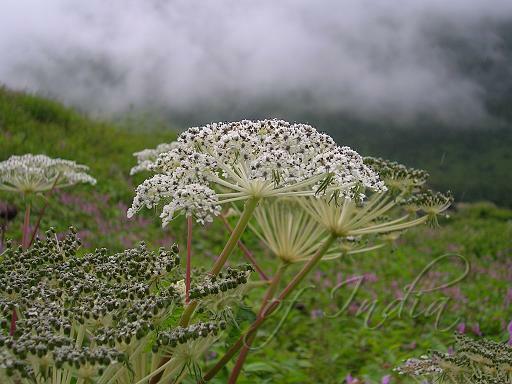 Nepal Hogweed is a small shrub which grows from Himachal Pradesh to Bhutan. It is somewhat similar to the Himalayan Hogweed. The stems can grow to 60-160 cm tall. Lower leaves are pinnate with toothed, deeply lobed, or pinnately-cut large leaflets. The upper leaves are arranged in threes, with lelaflets often 3-lobed. 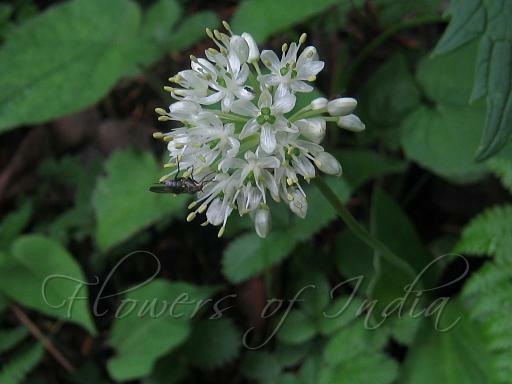 Flowers are small, white, borne in upright umbels. Fruit is obovate, to 1 cm, with lateral wings and weak ribs. 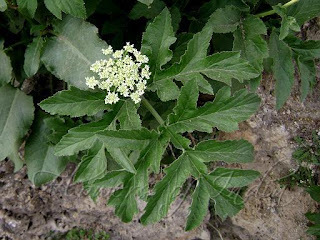 Medicinal uses: Nepal Hogweed is used in veterinary medicine. It exhibits stimulant property and increases the rate of respiration and blood pressure in goats. The root of the plant is used as a digestive, an aphrodisiac, a carminative and an antidiarrheal in folk medicine. 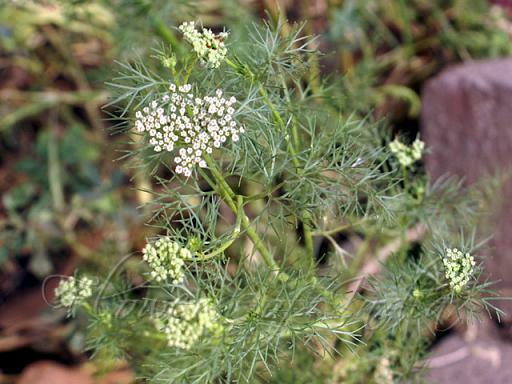 Hill Carrot is a herb from the carrot family.it is an erect herb 3-4 ft in height, with yellow flowers arranged in a compound umbel. It flowers during the later half of the monsoons. The fruit is used in curries as a flavouring agent. Hill Carrot is found in the Western Ghats. Medicinal uses: The infusion of the fruit is used in doses of ½ to 1 ounce like that of fennel seeds, as carminative, diuretic and stimulant in flatulency, gastric and intestinal disorders etc. Bhutkeshi is a hairless plant, 20 cm to 1 m tall. Stem is stout, base fibrous. Leaves are up to 30 cm long, hairless, double-compound. Pinnae are 1-3 cm long, lanceshaped to oval, pinnately divided or cut. leaf sheath are oblong, up to 8 cm long. Lower leaves are long-stalked, upper stalkless on the sheath. The flower cluster has an involucre of 1 or 2 linear bracts or none. Rays in the flower-cluster are 10-30, stout, hairless to velvety, 2-5 cm long. Involucel of 10-12 pinnate, pubescent bractlets, longer than the umbellet. Calyx teeth are linear. Fruit is 5 mm long, 2 mm broad, elliptic to subquadrate, ridges winged. Bhutkeshi is endemic to India occuring in Jammu and Kashmir, Himachal Pradesh and Uttarakhand. It is said to be common on alpine moist slopes and meadows. Flowering: July-September. 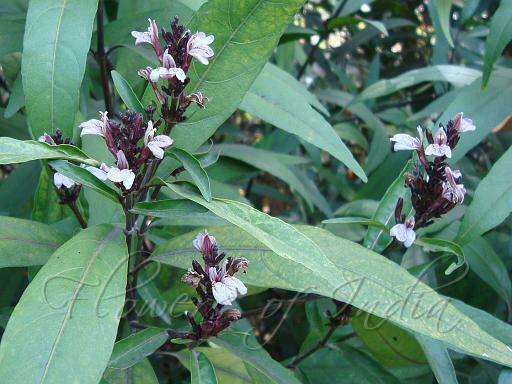 Medicinal uses: Root are used as nervine sedative. It is used as alternative source for Jatamansi. Ajwain is an erect, hairless or minutely pubescent, branched annual herb. The stems are grooved. the leaves are rather distant, 2-3-pinnately divided in narrow linear segments. Flowers are borne in terminal or seemingly-lateral stalked, compound umbels, white and small. The fruits are ovoid, aromatic, greyish brown. The mericarps, which are the components of the fruit, are compressed, with distinct ridges and tubercular surface, 1-seeded. This is what is used as the spice Ajwain, in cooking. Medicinal uses: Ajwain is also traditionally known as a digestive aid, relieves abdominal discomfort due to indigestion and antiseptic. Batino is common in forests and thickets at low and medium altitudes in many parts of South-East Asia. It was introduced in India and Sri Lanka. It is a medium-sized evergreen tree. The leaves are in whorls of three, oblong-obovate, 10-30 cm long, 5-7 cm wide, pointed at both ends, and short-stalked. The flowers are small, yellowish-white, and borne on short cymes at the end of branches. The sepal cup is small. 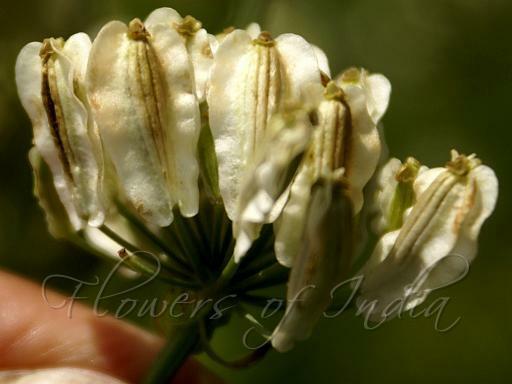 The flowers consist of a 1-1.5 cm long tube, opening into 5 pure-white petals. The fruit is a double follicle, pendant, very long, and slender, being 20-40 cm long. The seeds are small and very flat, with deep-brown, especially along the edges. Medicinal uses: In Philippines the bark, in the form of powder, decoction, infusion, tincture, or wine preparation, is used as a febrifuge, a tonic, an antiperiodic, and antidysenteric. Do you know casing of Sausage contains INTESTINE?